Neurovascular coupling is one of the key concepts for the investigation of brain functions. The higher rate of oxygen metabolism of cortical tissue following the onset of a stimulus is commonly correlated with an increase in blood flow. This increase is linked to a higher oxygen supply by the blood to the tissue and compensates the higher oxygen extraction. Consequently, there is an increase in oxygenation, i.e. an increase in the concentration of oxygenated haemoglobin and a decrease in the deoxygenated haemoglobin. The BOLD (Blood Oxygen Level Dependent) contrast in functional magnetic resonance imaging (fMRI) exploits this for an imaging of cortical function. Tissue oxygen monitoring using white-light reflective spectroscopy is well suited to record local changes in oxygenation, and functional related changes in haemoglobin from the opened cortex. Contrary to BOLD which is sensitive to changes in deoxygenated haemoglobin concentrations, the optical tissue oxygen monitoring is able to retrieve both the oxygenated and deoxygenated haemoglobin concentrations. Additionally, the oxygen saturation of the haemoglobin in the microcirculation can be obtained. 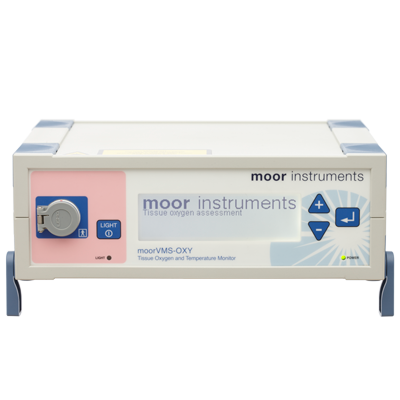 We recommend the moorVMS-OXY monitor, moorVMS-PC software and OP3 blunt needle probe. For simultaneous blood flow measurements, add the VMS-LDF1 or 2 and add a CP3 combined needle in place of the OP3. Elevating intracranial pressure reverses the decrease in deoxygenated hemoglobin and abolishes the post-stimulus overshoot upon somatosensory activation in rats. Neuroimage 52, 445 - 454. A Novel Embolic Model of Cerebral Infarction and Evaluation of Stachybotrys microspora Triprenyl Phenol-7 (SMTP-7), a Novel Fungal Triprenyl Phenol Metabolite. Neuronal activity induced changes of local cerebral microvascular blood oxygenation in the rat: Effect of systemic hyperoxia or hypoxia.